Tags: Bright Red, Jamawar, Kameez, Mehndi Green, Party, Punjabi, Shalwar. Red crinkle jamawar chiffon shirt has been embellished with embroidered neckline with stand collar with green applique. 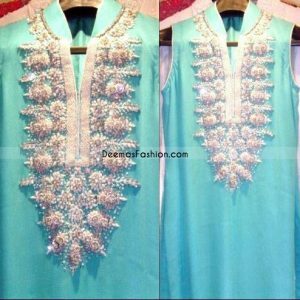 Embellishment includes thread, kora, dabka, beads, zardozi, sequins and crystal work. 100%hand embroidery. Concealed back zip closure. Finished with mehndi green piping. Red pure banarsi chiffon dupatta embellished with sequins spray all over and green banarsi piping on edges.